Nothing is more ‘merica than an American flag crochet halter top to wear during all your summer festivals and concerts. Its cute, hella patriotic, and perfect for these sweltering sunny days! Everyone will be asking you where you got your top from and you get to smile and say you made it, which is always a rewarding feeling. It’s so cute that they may wanna buy one from you! Definitely a money making opportunity here people! 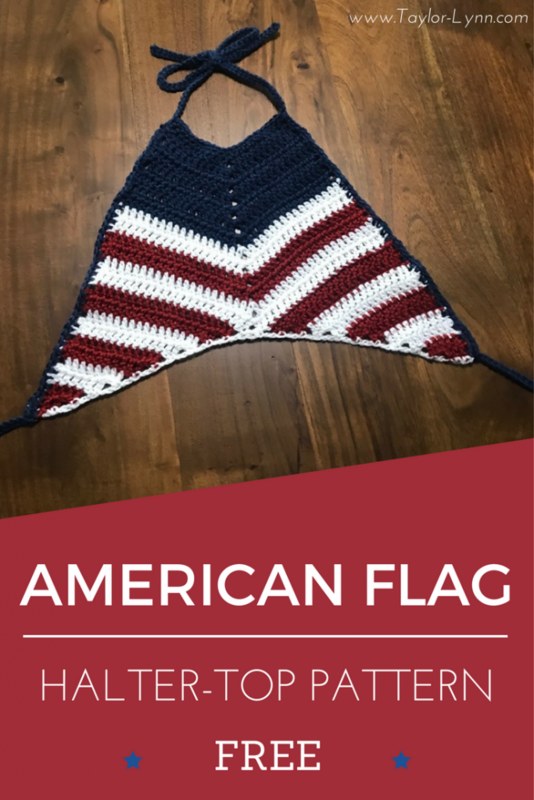 This is a top works up relatively quickly and after 1-3 episodes of your favorite show on Netflix playing in the background, you can have your own American flag crochet halter top! OR if you don’t feel up to making one, you can purchase one from my Etsy shop! Yarn: I used Caron Simply Soft for both tops in the colors Autumn Red, Ocean, and White. You can purchase this super soft yarn here which I absolutely LOVE! If you want to use acrylic yarn, I highly suggest this brand. 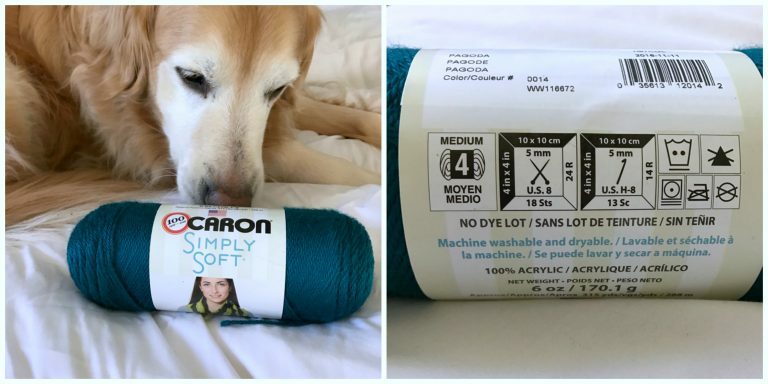 You can read my Best Acrylic Yarn post to find out more about Caron Simply Soft and why I love it. Regardless, any weight 4 yarn should work for this project. If you plan on using this top in water, as a swim top for example, you will want to use 100% cotton yarn. Acrylic yarn does not dry as nicely or as easily as the cotton yarn would. How much yarn you will use will depends on how long you make the the halter top and straps. One Skein each (315 yards) should be more than enough for multiple tops in this size. Caron Simply Soft yarn modeled by Bella. Crochet Hook: I used a 6mm Hook (also referred to as size J or 10). You could use a 6.5mm hook for a looser stitch, or a 5mm or 5.5mm for a tighter stitch as well. I have some other great summer patterns like this one you may want to check out like my Festival Tassel Crop Top or my Simply Cute Bikini top (Pictured below). That’s it! 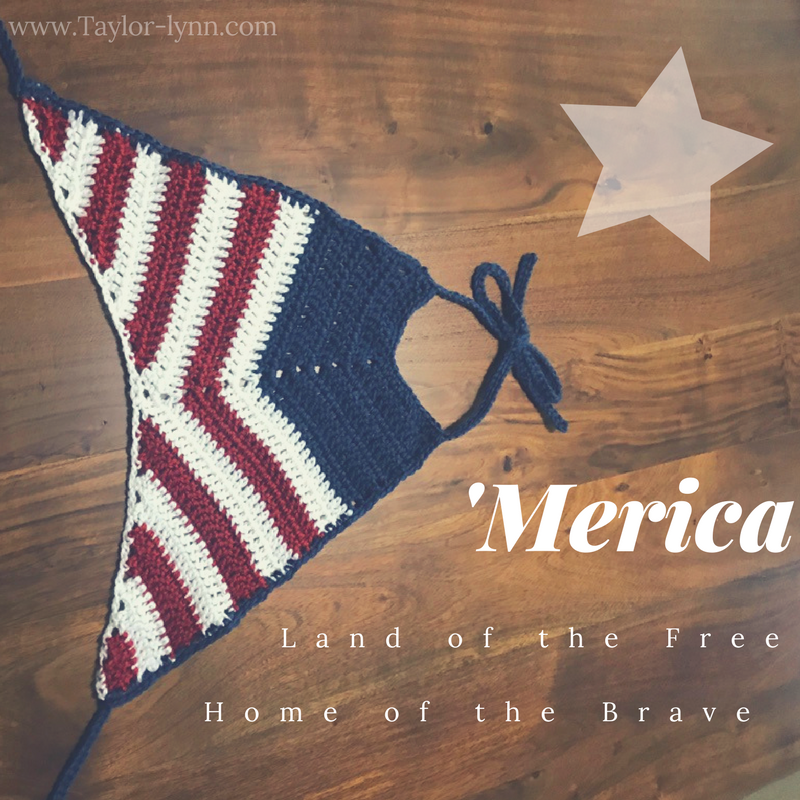 With those four simple stitches you can make your own American flag crochet halter top to rock all summer long! I would say this is a “one size fits most” kind of top. You can change your hook size to bigger or smaller to decrease/increase size or also alter the number of beginning chains. Make sure it is an odd number. One more option to increase the width of the top is to DC 2, CH2, DC 2 in each chain2space instead of doing just 1DC, CH2, 1DC. This will increase each row by 4 stitches instead of only by 2. For example in the picture below is a top I made for a friend who wanted a tighter stitch so this was made with 27 Chains to begin and a 5mm hook. I made one more row of stripes to add length and I also changed the border color when the top changed from the navy to the stripes! Don’t be afraid to alter this pattern to make it your own! Foundation Chain: With your blue yarn CH 25. Row 1: DC in the fourth chain from the hook. The chains at the beginning of the row will count as a your first DC. DC in the next 9 stitches for a total of 11 DC so far. In the next chain (the middle chain if you added or deducted chains) DC, CH 2, DC. Then complete 1 DC in the next 11 chains. CH 3 and Turn. Row 2-7: DC in each stitch until you reach the chain 2 space from the previous row. In that chain 2 space you will DC, CH 2, DC and then continue to DC in each stitch down to the end. Row 8-9: At this point you will Change to your white yarn and repeat the pattern from the previous row for 2 rows. Row 9-10: Now you will change to your red yarn and repeat the pattern from the previous row for the next two rows. REPEAT rows 8-10 until the bottom V of the top is at your desired total top length. I did one row white, then red, then white again and stopped. You can add additional rows to make the top fit your body. Now starting from the outer edge with the opposite color from the previous row (red if you stopped at the same row I did) and begin to DC in each ST across until you are 2 stitches from the chain 2 space. At this point stop, turn your work, and SS in the top of the last three stitches you just made. CH3 and DC back across the row. *Basically you are making little steps with each row to begin leveling out your work. Once you reach the end Change Color, CH3 and turn. Then again DC down the row until you are two stitches from your CH 3 in the previous row. Turn your work and SS in the top of the last three stitches you just made. Ch3 and DC back across the row. Repeat this until you are left with 1-2 DC’s and then tie onto the other side of the top and repeat same thing to make both sides symmetrical. Connecting Steps: With the yarn color of your preference (I used white) tie onto the bottom of top on either side. SC the 1-2 DC’s of the previous row. Then CH 2, and SC in the top of the next “step”. CH 2, SC in next step and repeat until you reach the other side of the corner. Feel free to use any of the three colors for your border and strap, but I used the blue! Also adjust length of straps to fit your needs! Tie onto the bottom left corner of your top. CH 60 and then SS in each CH back to the corner you tied onto making your first back strap. 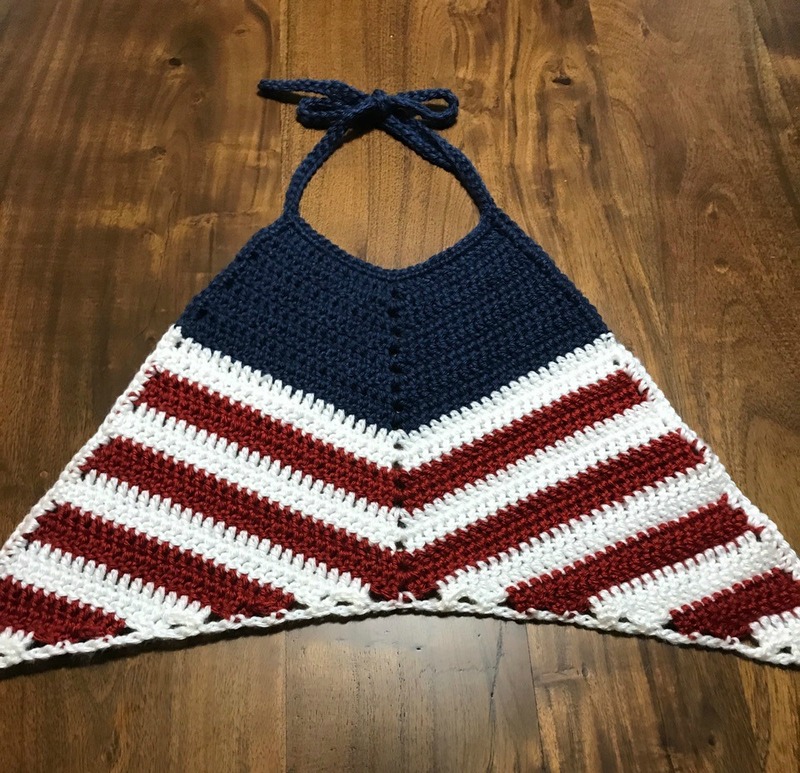 Now you are going to SC as evenly as possible along the side of your American flag crochet halter top. I usually do 2 SC’s per row of DC’s to help keep it even. Once you reach the top corner of your top, again you will CH 60 and SS in each CH back to the corner making your first neck strap. Continue to SC across the top of your halter to the other corner. Repeat the CH 60 and SS back down for the remaining neck strap. Repeat SC down the side and finish last back strap. You can choose to do another row of SC’s along the bottom of the top, but I like the look of the white on the bottom of mine. YESSSSSS we are! Now tie on your halter top and show of all your hard work! I guarantee you’ll be getting tons of compliments on it anywhere you go! So glad I got to share this awesome pattern with you! If you have ANY QUESTIONS please please leave me a comment below and I will get back to you ASAP! Also if you would be willing I would love for you to share your finished projects (and you wearing them out doing fun summer things!) on my blog’s Facebook Page! Thank you so much! 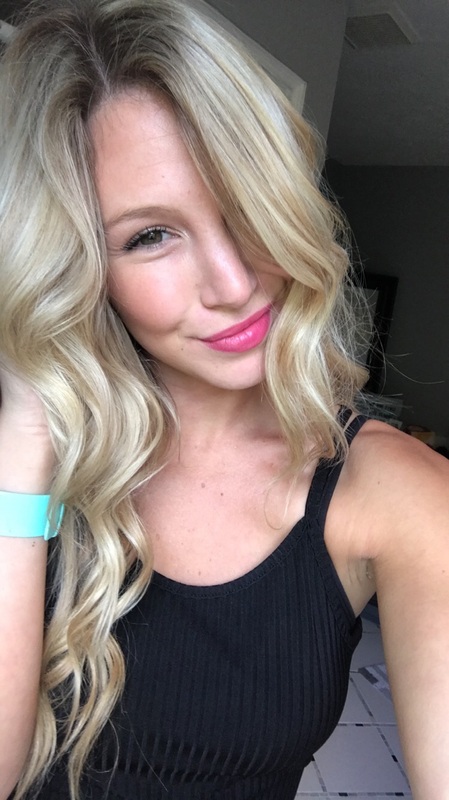 If you have any suggestions for future projects or tutorials please comment below! I totally agree! I just make most of my patterns in my size since its easiest to self measure. If you increase the number of chains on the first row and then also make more rows, it should work out just fine! I am currently making your “merica halter top” and the row 1 doesn’t exactly make sense. I’ve spent 2hours trying to figure it out. It says dc in 3rd chain from hook. The chains at beg will count as your first dc (which one chain or is it both 2 chains I’m skipping). Dc in the next 8 sor a total of 10dc (if i did the math correctly it wouldn’t equal 10…it would equal the 1dc i did in the 3rd ch from hook plus the next 8dc so I’m counting 9 total. Where are you getting 10?). Continuing in the next ch i do 1dc,2ch,1dc. Then in the very next 10 sts i do 1 dc in ea. At the end of the 10th dc, i still have 2 unworked sts… What do i do with them at any time throughout the pattern? So when you dc in the third chain and that ch2 you skipped counts as the first DC. And you dC in that third chain, that’s the first two ex of the row. Then you make 8 more making it 10 total DC. Make sense? Yes thank you. I am now at the end of the first row… I chained 3 but i still have 3 unworked chains in my foundation chain, is this normal?